Vemcon Management - Vemcon GmbH | Maschinensteuerung neu gedacht. Vemcon GmbH | Maschinensteuerung neu gedacht. 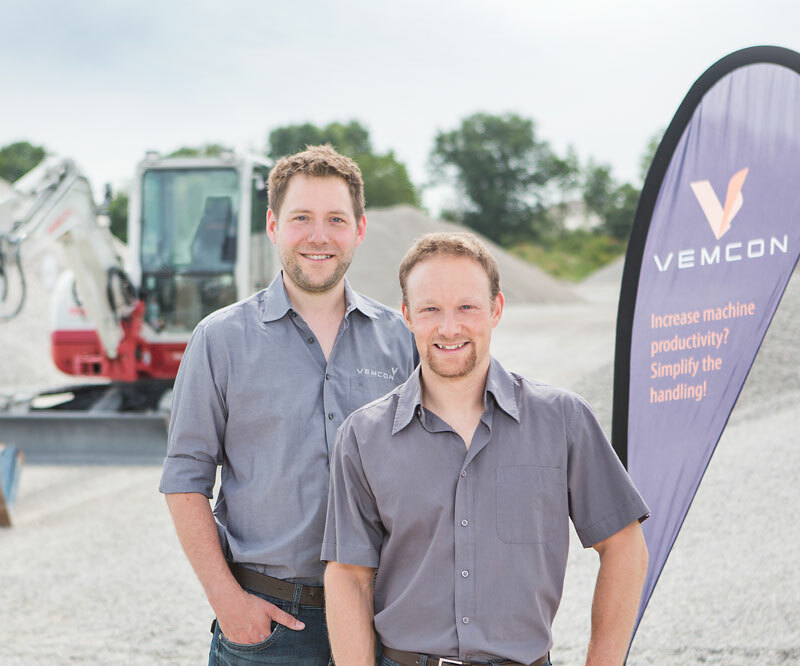 Jan Rotard and Julian Profanter founded Vemcon in 2012 and are managing directors. Jan Rotard (l), CEO, is responsible for marketing, sales, product management, finances and staff as well as software and electronics development at Vemcon GmbH. Early in life he drove and repaired machines, later he designed and built them. Before his time at Vemcon he worked on different development and construction projects for companies like Lehnhoff Hartstahl, Kinshofer and others. In total, he has more than 15 years of industry experience. Rotard has a degree in mechanical engineering as well as aerospace technology. Julian Profanter (r), CEO, is responsible for operating concepts, ergonomics, design, supply chain, production and quality management as well as property rights. His passion is the link between man and machine. Before and during his work as research assistant at the Institute for Materials Handling, Material Flow and Logistics at the TU Munich he went through various funded start up programs. Profanter has a degree in mechanical engineering. Jan Rotard and Julian Profanter are actively supported by their advisory council that brings in decades of experience in innovation, technology and management. Dietmar Zieger is mentor for startups, focusing on general management and marketing. Dietmar Zieger worked at Bosch for over 30 years with managerial responsibilities in sales, marketing and product management. His last role was president of Bosch in Korea. His experience in these roles covered all product areas at Bosch and all activities from personnel management through to business planning. For several years now he has acted as a mentor for startup companies with a range of different product ideas. Willem Bulthuis has been active in the international technology sector for 30 years. His roles have included Board Member, CTO and Global Head of Sales at Philips Electronics, NXP Semiconductors, Giesecke & Devrient and secunet Security Networks AG. He has lived in both Silicon Valley and in Europe with experience in a range of industries such as automotive, consumer electronics, semiconductors, media, telecoms, payment and IT security. He is Founding Partner of Mittelstand Ventures, managing Corporate Venture Capital units for family-owned companies.